After a stressful day, try slipping into our soft and cushy terry slipper socks. Same construction as Extreme Alpaca sock, but come just above the ankle. A little bit of luxury! 75% alpaca 23% nylon 2% elastic. 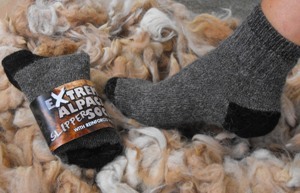 For sock/shoe size correlation, please see Extreme Alpaca Socks.